MB&F rarely introduces objets d’art so visibly rooted in horology as Kelys & Chirp: the Geneva-based independent watchmaker generally specializes in exotic and futuristic shapes, which, while still rooted in haute horology, rarely wear their origins on their sleeves. Great examples are the Horological Machine No. 6 Alien Nation and the Destination Moon clock, while the Starfleet Machine is a lesson in MB&F’s style of creativity that doesn’t tell the time, preferring to show its roots in its craftsmanship instead. Kelys & Chirp doesn’t tell the time. It is an automaton – and most automata grew from advances made in horology in the 1600s. Pierre Jaquet Droz (1721–1790) was perhaps the most famous automaton maker of his time, exhibiting a rare skill that continues to permeate the horological world to this day. In English, the word “clockwork” is still often used to denote mechanical, “windup” items that even include the type of toy that I remember from my own childhood. These were usually powered by keys, cranks, or even strings that triggered springs, which in turn powered gearing. The earliest of these types of automata can well be called “mechanical toys” and they were made for European (and later Asian) aristocracy. The turtle began appearing as a symbol of wisdom, knowledge, and longevity in the folklore of a variety of cultures as early as ancient Mesopotamia, and it persists in this role up to today with perhaps environmentalism added to its range of connotative symbols. It’s no wonder it, too, showed up in horology and automata as early as the 1600s. While automata were – and still are – reserved for just a lucky few owners throughout history some examples continue to exist, passed on from generation to generation through auction houses, museums, and collections of rare objects. Around 1610, Georg Fronmiller of Augsburg, Germany crafted a turtle automaton clock in gold-plated copper, iron, brass, bronze, wood, silver, and enamel, making this most likely the earliest known turtle automaton. It is currently at home in the Princely Treasury of the Hessian Museum (Fürstliche Schatzkammer, Hessisches Landesmuseum) of Darmstadt. An example of a walking tortoise recently sold by the Breker art auction house in Cologne is still in existence from the 1920s. A spring mechanism wound by key allows the paper-maché-and-wood animal with articulated head and limbs to realistically crawl. More decorative instances were made in the twentieth century, with Sotheby’s in 2013 having auctioned an interesting key-wound silver turtle automaton with a singing bird in its shell made in Germany in about 1975. While the work is not attributed, it certainly docks into the tradition begun there in the 1600s. This turtle’s silver case is elaborately engraved to represent turtle scales; its head moves when the bird sings. The bird additionally flaps its wings and moves its beak. In 2016, Sotheby’s once again auctioned a turtle automaton, this time made by Asprey in 1989. This example wound by key is ultra-luxurious in yellow gold, enamel, and diamonds. When the automaton is activated, the turtle crawls and its head moves. Independent watchmaker Raul Pagès created a one-of-a-kind white gold turtle automaton in 2013, also wound by key. 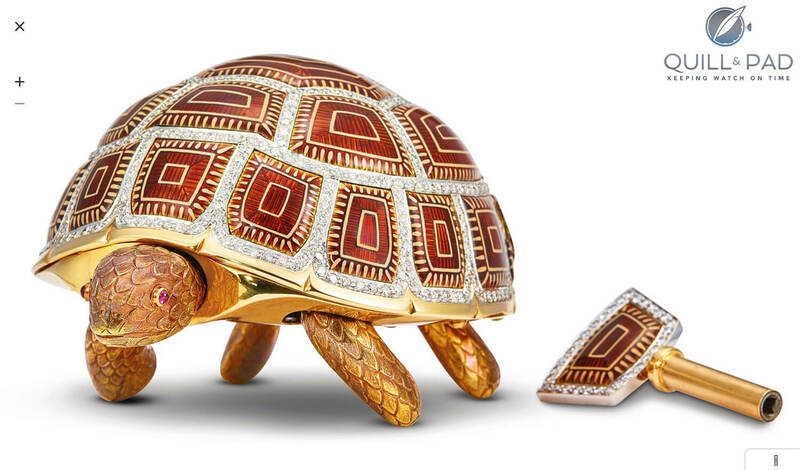 When the automaton set with diamonds on its feet and featuring sapphires for eyes is activated the turtle does a little dance that propels its forward, its head moving to the same rhythm thanks to a fully handcrafted movement comprising more than 300 components. Its beautiful blue shell has been engraved and enameled by Swiss masters of the craft. “My vision was to redefine the art of automata in a contemporary way with a unique, totally handmade (no CNC) tortoise with the utmost quality of finishing,” Pagès said as part of a greater conversation involving tortoise automata upon release of MB&F’s Kelys & Chirp in late 2017. Kelys is a rhodium-plated brass tortoise, whose name originates in the Greek word for chelonian reptiles (turtle, terrapin, tortoise), while Chirp is a white gold singing bird with sapphire eyes that Kelys carries in and on his back. Like the silver German example above from 1975, Chirp emerges from one of the scales to sing, flap wings, move its tail, and open its beak for 10-12 seconds. This incredibly complicated animal combo comprises 480 individual components and weighs in at a surprisingly hefty 1.4 kilograms. Nicolas Court and his team based in Sainte-Croix, Switzerland, developed the turtle’s mechanism so that its power comes from the singing bird’s mainspring. The turtle’s mechanism operates in a similar way to a complication module added to a wristwatch movement. The turtle’s low ratio elliptical gearing ensures that minimal energy is required to set the long-lived animal in motion, while cams move the legs – which, incidentally, realistically replicate a turtle’s gait, where the animal pushes off with both rear legs while the front pair of legs catches up. Perhaps the coolest element of this is the friction clutch security system Court added so that Kelys is able to detect surface edges; this mechanical element gives the turtle the ability to avoid falling to its destruction from a desk or table. To create Chirp, Reuge utilized a 230-year-old invention that is generally credited to Pierre Jaquet-Droz. By 1785, Jaquet-Droz had both miniaturized a mechanically controlled bird and developed a compact movement to control its motions. He was successful in miniaturizing a realistic birdsong by using a single bellow of variable pitch with a sliding piston rather than multiple single-pitch bellows that were commonly used up until then. The quality of the bird’s song and how well it carries – even in modern-day Jaquet Droz’s creations, which use a newer technology involving three sapphire crystal tubes with a carbon fiber piston to create air compression – are astonishing (see The Whimsical Song Of Jaquet Droz’s Charming Bird and Jaquet Droz’s Magnificent Charming Bird Returns In An Exquisite Métiers d’Art Version). Reuge, a company that has been continuously manufacturing its amazing music boxes and luxury objects for more than 150 years, continues to use Pierre Jaquet-Droz’s original technology for its traditionally minded bird. And Reuge invented a security system for the bird as well: if Chirp or the piece of leather turtle shell scale that covers her when she’s not singing are accidentally pushed down mid-song, she instantly ceases and retreats. No harm done (which would not have been the case on antique songbird automata). Büsser, in talking with Reuge CEO Kurt Kupper on how to shed new light on the traditional singing bird – which is the actual point of MB&F’s inspiration in presenting Reuge and Court’s collaborative piece – says the idea came very naturally. “I looove automatons, and five years ago had already gone to see Franҫois Junod in Sainte-Croix,” the enthusiastic company founder explained to me in a recent interview, citing the famous modern-day creator of such oeuvres as the Van Cleef & Arpels Fée Ondine and the Parmigiani Fleurier Hippologia. And in case you were interested, know that elephants too have a long history in horology. For more information, please visit www.mbandf.com/en/machines/co-creations/Kelys-Chirp.